PhoneArena has managed to grab leaked documents of the upcoming Apple tablet via an anonymous tipster, which reveals the detailed specifications of the said device. 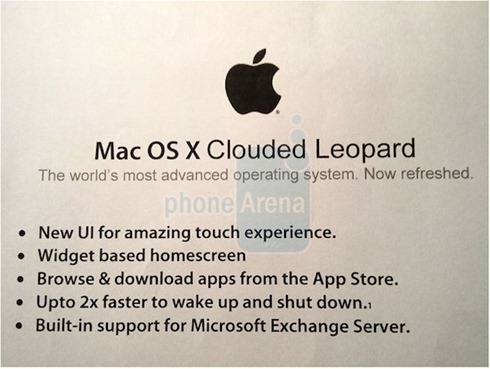 While the authenticity of the document is in question, what is more interesting is the fact that it will be running on top of Intel Core 2 Duo processor, will feature projection capabilities, and will be powered by OS X 10.7 “Clouded Leopard”. First up, a Core 2 Duo processor is way too much for an internet tablet like device, and it wont help Apple keep the tablet size as thin as some of their other products. The projector feature may sound cool to some but it is probably not something that I think Apple would like to include in a version 1.0 of the device. And finally “Clouded Leopard” ? now that doesn’t make much sense as Apple has recently released OS X Snow Leopard for desktops, and iPhone OS (aka OS X Mobile) runs on their portable devices such as iPhone and iPod touch. If anything, Apple tablet will most likely be based on the iPhone OS (aka OS X Mobile) rather than the fully featured desktop version of OS X, with full compatibility to run apps from the App Store. 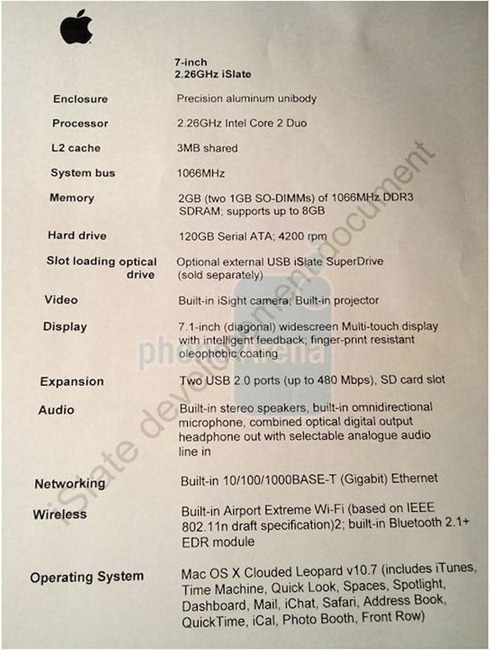 The leaked specifications document in question is attached below. Check the specs out and judge them yourself on whether this is the read deal or not? You can follow me on twitter or join our facebook fanpage to keep yourself updated on all the latest from the Mac maker Apple Computer, Inc.
How can the specs be possibly better than the MBA? They might replace MacBook Air with this device and just like the iphone set a new standard by not having a keypad on a phone probably they will eliminate the keyboard on a laptop starting with this device. that's just my opinion. Clearly a fake. With the HUGE success of the app store and the available Apps Apple would be insane not to put the iPhone OS on the tablet, just think about it. Besides, Apple already has told several key developers to prepare their apps for full resolution sizes. I just hope they add multitasking this time around! If the document is true,then they have not specified whether the HDD is regular one or solid state. can you have a 4200rpm solid state? Fake, a HDD in a Tablet device? Apple isn't mad, SSD!! and a 7.1 inch screen??? ?